This content was published: August 9, 2012. Phone numbers, email addresses, and other information may have changed. 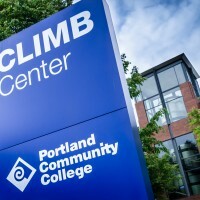 PCC and the Department of Environmental Services at the City of Portland have recently partnered for an outstanding project now completed at PCC’s CLIMB Center (Continuous Learning for Individuals, Management and Business). 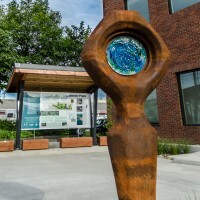 There you can see a new sustainable stormwater management system with an interpretive exhibit, gorgeous public art and a new rain garden, which collects stormwater runoff from CLIMB’s roof and the adjacent streets. The stormwater project collects roof runoff and sends it cascading over concrete and steel slabs into the rain garden, while street runoff flows into the facility under a steel sidewalk grate. 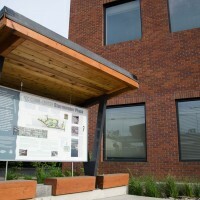 An interpretive kiosk, covered by a green roof, also absorbs rain, and the kiosk describes how the rain garden captures and filters stormwater to keep runoff out of the sewer system. PCC faculty members Scott Judy, Jim Jeffery and Geoff Snook and PCC welding student Christopher Debrand created the steel supports for the kiosk and CLIMB associate Michele Belunes helped oversee many aspects of the project as well. The benches near the kiosk tell a special story, they are made from wood salvaged from several 100-year-old warehouses when the industrial district was recently re-developed. TS Construction Management donated labor to build the kiosk, Beam Development donated the salvaged wood, and Teufel Landscape and Tremco Roofing donated the green roofing materials. Part of the project funding came from a U.S. Environmental Protection Agency Innovative Wet Weather Program grant. The site features a six-foot steel sculpture by Portland artist Linda Wysong titled “Eye River,” that was inspired by the six-inch steel spikes, known as “log dogs,” once used to build log rafts. In the early 20th century, one of Oregon’s largest sawmills operated near the rain garden and processed logs that arrived floating on the Willamette River tied together in huge rafts. 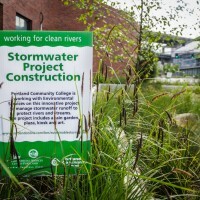 The rain garden project is part of the SE Clay Green Street Project, which will extend for 12 blocks between SE Clay and SE Water Avenue and will link outlying neighborhoods to the Central Eastside Industrial District (CEID) and the Willamette River. City engineers are working on the project design. Construction should begin next spring. If you are down in the area, be sure to visit this innovative stormwater system.